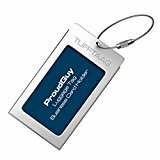 HIGH-QUALITY ALUMINIUM LUGGAGE TAGS; ProudGuy TUFFTAAG Luggage Tags Business Card Holder are made of special grade reinforced aluminium to withstand the harsh conditions of extensive travel. Size: 6 cm x 10.5 cm x 0.4 cm. You’ll enjoy years of effortless use while looking stylish and professional wherever you land. STURDY STEEL CABLE SUITCASE TAGS; each tag comes with a thick cable that’s made of sturdy steel to ensure that they stay properly secured to your luggage while you are traveling. GOOD FOR ANY LUGGAGE; from spinners to suitcases, gym bags, briefcases, golf bags, baby strollers, tool boxes or musical instrument covers. These travel tags can be conveniently fastened through the handle of any type of luggage. PERSONALISED ID BAGGAGE LABEL TAGS; these luggage card holders allow you to personalise your luggage in two ways. Write your own details with our easy to use name cards. Printable PDF name cards and slogans are provided with each purchase. You can also easily use your own business cards for the executive traveller. Be aware that if your business card has text printed on the edge, it may be covered by the casing frame. If you wish to hide your identity simply flip your name card over. PERFECT GIFT IDEA; these stylish suitcase tags are perfect presents for Valentine’s Day, weddings, birthdays, Mother’s or Father’s Day. Especially nice Xmas gift for that traveler in your life, or look stylish this season on your own holiday travels! Backed by a Year Guarantee. Click the Orange button to Order Yours Now! ProudGuy new TUFFTAAG metal best selling luggage tags speed up airport travel with an easy to identify design guaranteed to stand out on the luggage carousel! Impress your fellow travellers and co-workers with these modern ID tags. Use our custom template for your information, or give it your own personal touch with your business card, perfect for unexpected networking opportunities! These versatile, customisable tags are also perfect for carry on luggage, golf bags, flight cases, music cases, executive briefcases, ski equipment, baby car seats and strollers, ski gear, bikes, photographic film equipment, sports bags, medical equipment and any other items that require a secure label. Made from strong aluminium or stainless steel with a sturdy steel cable screw attachment, these distinctive tags are a proven leader over leather or plastic types that can become unreadable from moisture damage and easily detach during airport handling. Approximately 26 million pieces of checked luggage went astray on international flights in 2011, so ensure you label your travel baggage professionally so your journeys remain stress free by insisting on ProudGuy’s TUFFTAAG! This item is manufactured and sold exclusively by ProudGuy and only authorised dealers. All listing text and photos: Copyright © ProudGuy 2015.